Head injury in children is a concern many parents have. Children bump their heads often, especially when they are learning to walk. As they get older, there are more risks including falls from beds, couches and playground equipment. The more serious head injuries occur with major trauma such as car accidents, fights or abuse. It is important with any head injury to seek immediate medical attention. If the victim is unconscious, make sure the airway is kept clear, breathing assisted and circulation maintained while waiting for help. Internal bleeding in the brain is very serious. The good news is that minor bumps to the head usually resolve on their own. 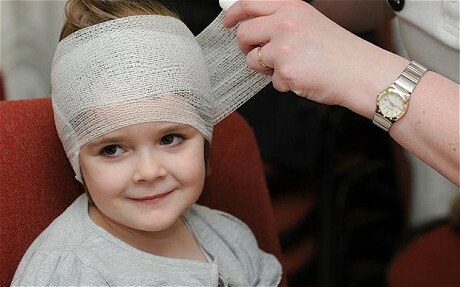 Parents always want to know if head injury in children is serious or not. The following article contains a few head injury guidelines. If you think your child may be suffering from any of the following, please check with a physician for any kind of head injury advice. A common head injury in children is a “goose egg”. These usually appear on your child’s head after a minor bump. This is because your child’s scalp area is full of fragile blood vessels. After they hit their head, the veins will leak blood into the scalp tissue and cause a large discolored bump. Many doctors will tell you that this is normal and will probably go away after about a week. It is still important to check with your child’s doctor if they do bump their head even lightly. Also, if your child does bump their head and you do not see a goose bump, but they have other symptoms of a head injury, it is important to check with the doctor. The swelling could be on the inside. Bumps to the head that have no visible marks on the outside could have caused an injury on the inside. An internal head injury in children tends to be rare, but is possible with steep falls or harder bumps to the head. Internal head injuries may cause bleeding into the brain, bruising, skull fractures or a traumatic brain injury. This is because even though there is a fluid cushion around the brain, a strong bump can make the brain hit the skull. These are very serious injuries and need to be evaluated, monitored and treated immediately by a doctor. If you notice any symptoms from the moderate or severe categories below, seek immediate medical attention. If your child loses consciousness and is not alert or responding, call 911. Symptoms of head injuries in children are according to the level of trauma received to the head. Minor Head Injuries: Watch closely for more advanced symptoms. If more symptoms appear then contact your child’s doctor or go to an emergency room. Moderate Head Injuries: If your child has any of the following symptoms, call 911 or take them to the nearest emergency room. They should be monitored in the hospital for at least 4 hours. Severe Head Injuries: Call 911 right away! Apply and ice pack to the head for 20 minutes at a time. Make sure you cover the pack in a towel. Watch your child for the first 24 hours. Look for signs of internal head injuries below. If your child falls asleep, wake them every few hours and watch for signs of worse injury. When to See a Doctor: You need to seek medical attention if your child has the following signs; vomiting more than twice, excessive crying, unsteady gait when walking, pain in the neck or head, hard to comfort, and/or hard to wake up. Internal Head Injuries: You need to call 911 immediately if your child has any symptoms of an internal head injury including; unconsciousness and won’t wake up, irregular breathing, open wounds, clear discharge or bleeding from the mouth or nose, problems talking or seeing, seizures, or unequal pupils. Internal head injuries are very serious. The faster your child receives medical attention, the better chances of preventing more serious issues like brain swelling, coma, or even death. Childproof your home: Take precautions to prevent falls and head bumps. Use baby gates at the tops of stairs, keep upstairs windows locked, and use vigilance with playground equipment like trampolines. Encourage use of headgear: Make sure your kids use appropriate safety gear for sports. Bike helmets and ski helmets are usually required by law in most states. Encourage helmets for skate boarding, roller skating, and full contact sports. These lower the risk of serious head injury by 85%. Always use a car safety seat and seatbelt: If your child requires a car safety seat, make sure you have the right size for your child and that it is installed properly. Always make your older children fasten their seatbelts. Keep your child quiet after a head injury: This is especially important if your child has a concussion. Keep your child quiet, the noise down and lights low in the house. However, it is important to wake your child up every few hours during the first 24 hours after a head injury. Avoid sports and rough games during recovery: The brain needs quiet and rest in order to heal. After a head injury, your child needs to avoid rough games and sports during playtime until the doctor says it is okay to return to these activities. A second concussion after the first can be very serious.